Glow Disc Golf once again at Morris Park during the Festival of Lights. This event will help raise funds for the United Way of Marion County. Entry fee is $30 and includes a custom stamped glow disc, Pizza Party and an extra Glow Light for another disc. We will have extra glow discs and lights available at the event. Awards to the Top 3 Overall Players!!! The course will be closed off to the Festival of Lights walkers and car travelers so, we have the course exclusively to ourselves for this fun charity event. We will also have some portable lights available to help keep your discs glowing bright! 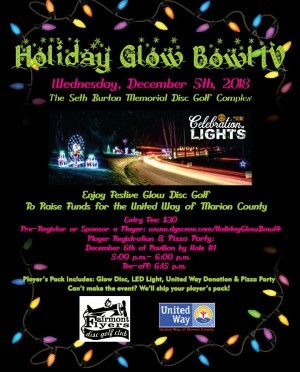 This is a Charity Glow Disc Golf event during the Festival of Lights! All proceeds will be donated to the United Way of Marion County. Everything starts at 5PM at the Seth Burton Memorial DGC by hole #1. Why are we doing this? To have fun and raise funds for the United Way of Marion County! Want to have even more fun at this event? You can buy an unlimited # of Mulligans for $1 each!!! 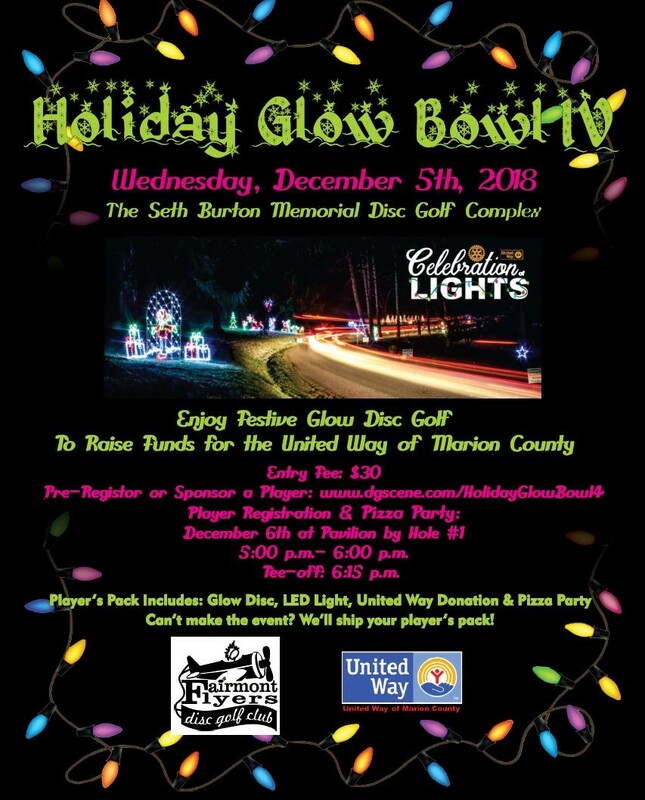 If you can't make this event but still want to support the United Way of Marion County (and get a cool Glow in the Dark Golf Disc) just sign up for the event and choose the "ship my player pack" option. We will ship out all of these packages the week after the event. Sponsors: Fairmont Flyers Disc Golf Club, Copper House Grill, Crockett's Lounge, Marion County CVB, City of Fairmont, Rotary Club of Fairmont and you!